Charles Duze decided that he didn’t want to wait to make it big before achieving his goal of helping others. He and some colleagues started LittleDrops, which helps some of the world’s most vulnerable children dollar by dollar. “We have a responsibility to do at least a little bit to make the world a better place,” said Charles Duze, one of the founders of LittleDrops and a software tester for the Outlook group. Charles Duze always had a plan to help others just as soon as he made it big. Then one day several years ago, he realized that by waiting to “strike gold,” he’d been taking the wrong approach. “I was like, ‘Wait a minute, I am not rich. But I don’t have to strike it big to make a difference. 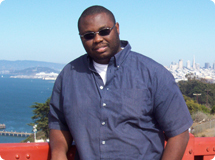 Little drops here and there can make a huge difference,’” said Duze, a software tester for the Outlook group. Duze and his friends brainstormed about how their organization would work and spent most of 2005 shaping it and learning the ins and outs of nonprofit regulations. They decided that LittleDrops would try to provide orphans and vulnerable children with support in their formative years, including food, clothing, and education, which would in turn improve their chances of a successful future. They sought out already-established orphanages in rural areas, with the goal of supporting and monitoring the children until they reach adulthood. “Even though we can’t save the world and fix everything that’s wrong, we can do very little bits here and there to really make a difference,” Duze said. LittleDrops had its first fund-raiser in 2006 and, with the money it raised, was able to give support to six homes for orphans in Nigeria. The next year, the organization was part of Microsoft’s Giving Campaign and was able to support seven more homes in Kenya. LittleDrops is now looking to help orphanages in Cameroon, Ghana, Rwanda, and Uganda. LittleDrops is currently 100 percent run by volunteers and “elbow grease,” Duze said. The group meets once a month to discuss fund-raising, operations, ways to seek donors, and ways to get information out. There’s a high burnout factor, but a high reward factor as well. 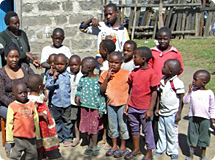 LittleDrops seeks out existing orphans homes to help, such as the Cecelian Orphans Home in Kenya. The end result, they hope, will not only be helping the children but letting them know they are not abandoned or alone. The organization’s “little drops” so far have included paying for school tuition, providing bicycles for children who commute to school, repairing beds and purchasing new beds and bedding, buying school supplies, helping with medical bills, and providing food and supplies for the orphanages to raise and grow their own food. Ekeh has traveled to Africa to visit one of the homes the organization had helped. He saw firsthand the issues orphanages there are facing, including little to no education for the children, medically vulnerable children, orphans with HIV who are isolated from the other orphans, orphans dressed in tattered clothes, and single parents pleading for help from orphanages. 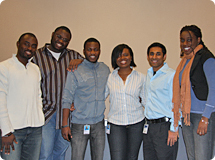 Some of the LittleDrops volunteers include, from left to right, Ike Ekeh, Charles Duze, David Edoh-Bedi, Amara Osisioma, Tri Hiremath, and Tuokpe Ogharaerumi. Learn more about on LittleDrops, including how to contribute or volunteer. Watch a video about the efforts of LittleDrops in Kenya last year. See some pictures of the orphanages supported by LittleDrops.